Clear Pond began offering premiere pond clarification products in 1977, and ever since has been a leader in providing natural based products used by the aquaculture industry the world over. The company was the first to ever offer lab grown beneficial bacteria cultures and specialized enzymes to aquarium hobbyists. Clear Ponds line of water clarification products is renowned for its commitment to using only ecologically safe materials with natural components, so you can rest assured that your water treatment is safe, simple, and effective. 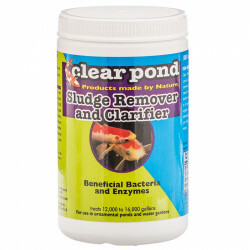 Sludge Remover and Clarifier utilizes beneficial bacteria and enzymes to help break down remnants of old food, fish waste, dead algae and organic toxins that can gunk up a pond fast. 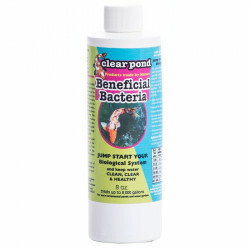 Clear Ponds beneficial Bacteria formula contains specific cultures that work to break down odor causing chemicals, toxins and clouding agents to keep your pond water looking and smelling fresh and healthy. 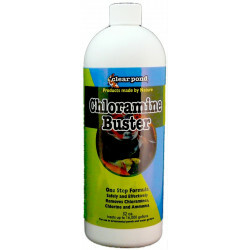 Use Crystal Lagoon to clear cloudy water caused by algae, dirt, bacteria and other organic materialm as well as to remove metals from your water. Be sure to browse all of our Clear Pond products to make sure you find just the right treatment for your pond. 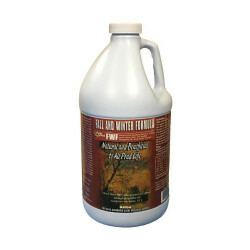 Pet Mountain is proud to offer you a wide selection of Clear Pond products, at the very best prices available anywhere! Take a look at all of our huge selection of great deals! Cant find something youre looking for? Let us know! Wed love to help. Be sure to check out our online coupons and discount shipping on all your favorite products.